I am not a fan of Tom Cruise. I do not hate him; I just do not think he is the cat’s meow. I like some of the films he has been in – Jack Reacher, Mission Impossible: Ghost Protocol (the other Mission Impossible films take themselves just a little too seriously for my tastes), and maybe one or two others that I cannot recall right now. I have never understood all the fuss about Top Gun. If I do not like Tom Cruise, then why am I bringing him up? Well, a little while back, I had some time to kill. I was trying to find something on the tube to watch to chase away the boredom. Jack Reacher was playing and, after that, Oblivion. I caught the last ten or so minutes of Reacher (it looked pretty good, from what I saw) and I was right on time for Oblivion. Despite some trepidation, I watched it. For those of you who have not seen it, the story focuses on one Jack Harper (Tom Cruise). Jack and his female partner, Victoria (maybe, I never got her name straight), are on a watch station outpost on a devastated Earth. Their job – along with the job of a few other teams like them – is to maintain a series of drones that are routinely scouring the radiation-free parts of the planet. These drones are programmed to hunt down and kill Scads, the aliens who destroyed Earth’s moon and totally ruined the world. Both Jack and Vic have had their memories wiped to protect the rest of humanity, which has retreated to Jupiter’s moon, Titan. Once the Scads are all gone, Jack and Vic will go back to Titan as well. Although they have had their memories wiped, Jack still has occasional flashbacks. Some of these include a woman – someone who is not Vic – and himself. Jack knows this woman is important, but he also knows he is not allowed to remember her. Or the rest of his previous life. If he does remember, and he is caught, then humanity’s refuge on Titan is toast. But that does not stop Jack from trying to remember; it does not help him become more at ease with Vic, and it does not stop him from collecting bits and pieces of things from the ruins of the buildings he goes to when a drone is damaged and he has to repair it. In fact, Jack has a whole house he has built by a lake chock-full of things he has collected. Vinyl records, books, pilot’s glasses (movie reference! ), an NYC baseball cap, and a stuffed toy gorilla are among the loot he has filled the house with. Whenever he can escape Vic and “Control” – the people who monitor his and Vic’s work – Jack heads to this retreat for some alone time. In this setting, he also has more time to try and remember. But, frustratingly, he cannot recall much. Just more images that do not make sense. Then, one day, Jack discovers the Scads have set up a beacon. He disables it, but a few hours later, a space ship crash lands not far from where he found the beacon. Jack heads to the ship and searches the wreckage, finding at least four humans in sleeping capsules in the debris. One of the humans is the same woman from his fragmented memories. Suddenly, a drone arrives and starts destroying the pods. Jack is unable to save three of the four survivors, but he is able to prevent the drone from killing the woman he remembers. He takes her back to the watch station, where he wakes her up. The strange/familiar woman introduces herself as Julia, and recovers from her long hibernation to hear the story of what happened on Earth; how sixty years ago, the Scads destroyed Earth’s moon, thereby wiping out half the planet, and humanity finally managed to beat them back before hightailing it to Titan. However, the story does not explain why Julia obviously recognizes Jack, why he recognizes her, or why the drone destroyed the other survivors. Vic is determined to call in this survivor’s presence to control, but Jack talks her down, delaying the news for at least a day. The next morning, Julia convinces Jack to take her back to the wrecked ship to get its log records. They get to the ship wreckage and Julia gets the black box she wants so desperately. But while they are there, the two are ambushed and captured by Scads. Taken to an underground base, Jack learns the Scads are not aliens at all. They are actually humans, and the drones are designed to kill them. They killed the survivors from the downed ship, the Odyssey, because they only recognize Jack and Vic. After dumping all this information on Jack, the base leader lets him go, suggesting that he should look into the so-called “radiation zones” Control will not allow him to enter. Jack and Julia leave the base and go to a building, where Jack uses the building’s radio to “text” Vic and let her know he’s all right. He goes up to the top of the building standing in what was New York City and finds Julia in front of a set of binoculars – you know, the kind you put a quarter in and they let you see through them? Well, these binoculars bring both her and Jack down memory lane. And Jack finally gets to recall why he knows Julia – she’s his wife! Okay, impossibly long story short, Jack tells Vic the good news but she is convinced he has been compromised. She is killed by a drone when she tells Control she and Jack cannot work together anymore, and the machine nearly finishes off Jack as well – before Julia fries it. The two then escape the tower and end up in a small desert outside New York – what was New York. Turns out, this desert is a radiation zone…. And when Jack runs into another technician in the zone, he finds himself looking at himself! The real Jack Harper died sixty years ago. His clones have been used by an alien force to decimate Earth and keep the human population under control and out of the way, while the aliens steal water from what is left of the planet. This is why the drones do not recognize other humans. They are only programmed to respond to the clones of Jack Harper and Vic. On the whole, I would say Oblivion is two hours of my life that I will never get back, to paraphrase a friend. It was not a horrible waste of time, but it is not a movie I think I could put up with watching a second time. So why did I bring it up? Two reasons. One, the CGI effects for this film are amazing. Even when I saw the advertisements for the film, I thought they were good. I especially liked the dragonfly-style helicopter Jack got to fly around for a good part of the movie. 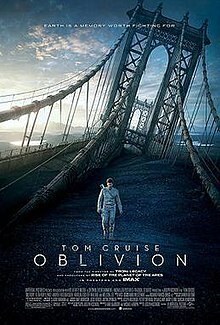 The second reason I bring up Oblivion hit me the night after I saw the movie. Despite its flaws, slow plot, and rather dreary outlook on life (not to mention its fairly predictable use of clones), there was one thing that I realized was good about the film. The alien thing that made all the clones of Jack Harper made clones of Vic – the real Jack Harper’s co-pilot aboard the Odyssey – to distract him. Despite overwhelming programming, despite wiping his memories as best it could, there was one thing the alien could not remove from Jack Harper. And in part, it could not remove it because it did not understand it. No matter how many clones of Jack Harper were running around, they all had the same memories of Julia Harper. The alien could not wipe out the real Jack Harper’s love for his wife. The alien could get rid of everything else – except that. Subsequently, it could not extinguish that memory in the clones. So, basically, true love conquers yet again. It only took – oh, sixty years. But better late than never, right? This entry was posted in Movie Reviews and tagged Aliens, Andrea Riseborough, Jack Reacher, Melissa Leo, Mission Impossible, Mission Impossible: Ghost Protocol, Morgan Freeman, Movie Reviews, Nikolaj Coster-Waldau, Oblivion, Olga Kurylenko, post-apocalypse, Science Fiction, Tom Cruise, Top Gun on September 12, 2015 by The Mithril Guardian.